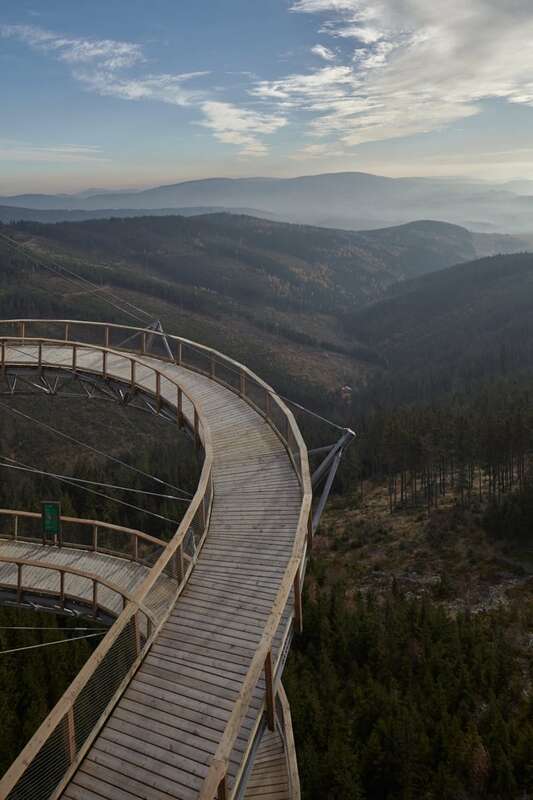 Zdeněk Fránek is an on edge architect who has created, among many other unusual structures in the Czech Republic, the infamous Skywalk. 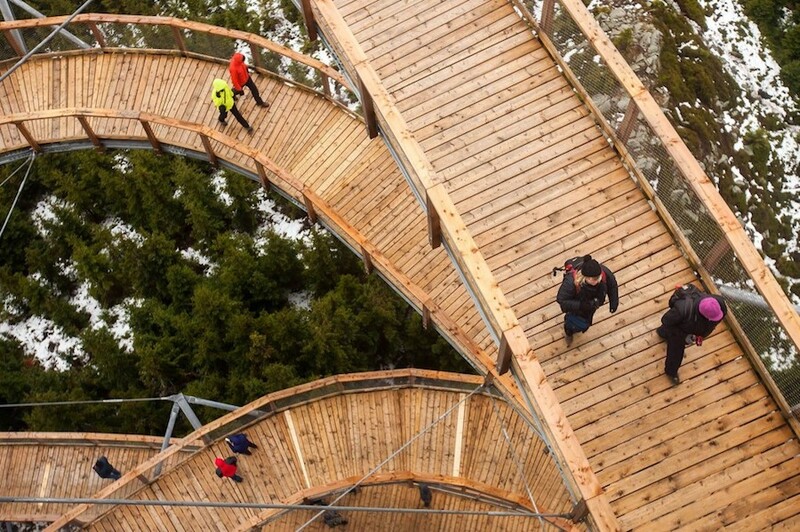 The Skywalk is an enormous wooden structure with a stainless steel and metal frame created as a scenic lookout tower for the beautiful surrounding landscape. Built together with the Brno-based architect and the construction company Taros Nova, The Skywalk took six months to complete. 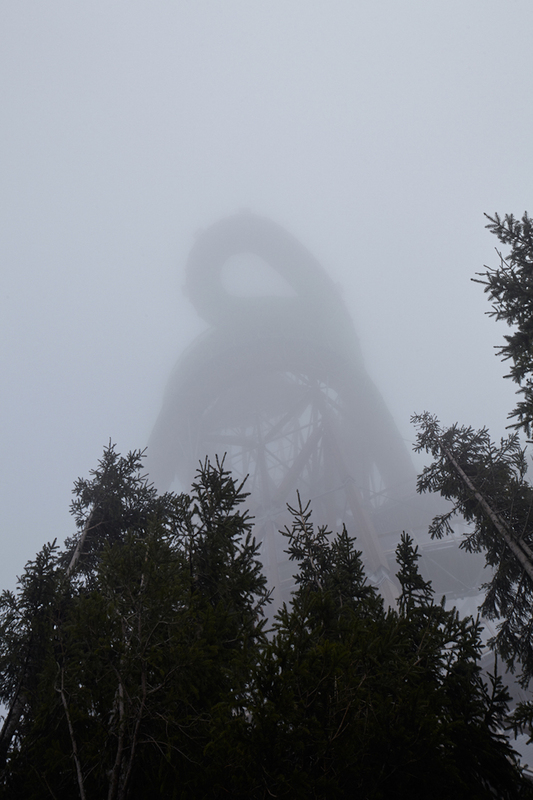 The highest part of the tower stands 55 meters above the ground. On the skywalk, the top is not the final destination though, the path on the way is what really makes it special. Made up of wooden planks and supported by a steel truss, it gently inclines, ramp style with hand railing throughout. 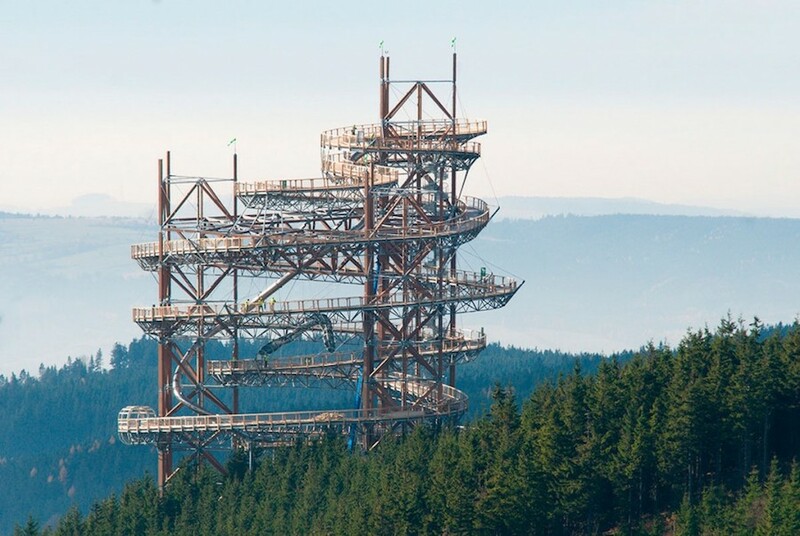 This observation tower was built in Dolní, Morav between the Orlické and Jeseníky Mountains in 2015. 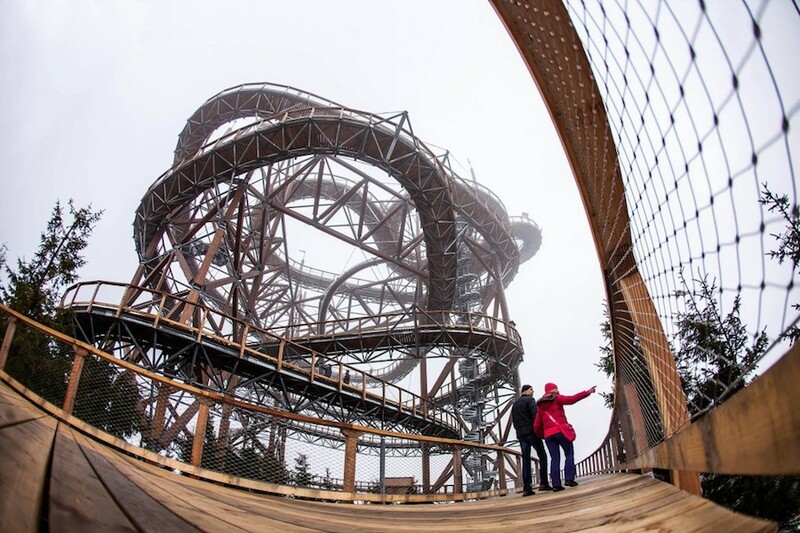 The wooden pathway is accessible to wheelchairs and strollers, and features multiple twists and turns made to give the climber many views and lookout points. From a distance, it’s abstract form is easily recognizable. 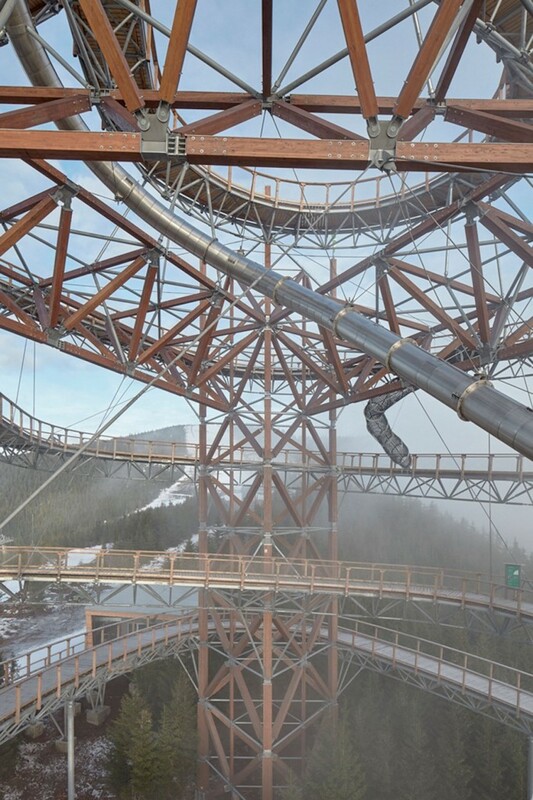 Due to the fact that it is located on the very peak of an exposed mountain which itself is 1,116 meters above sea level, and to withstand the extreme weather conditions of the foggy mountains, many reinforcements have been added to ensure safety and balance, including cables and a concrete foundation. The actual path twists around three main constructions, and in the middle, an emergency spiral staircase is accessible. The magnitude of this tower is breathtaking. 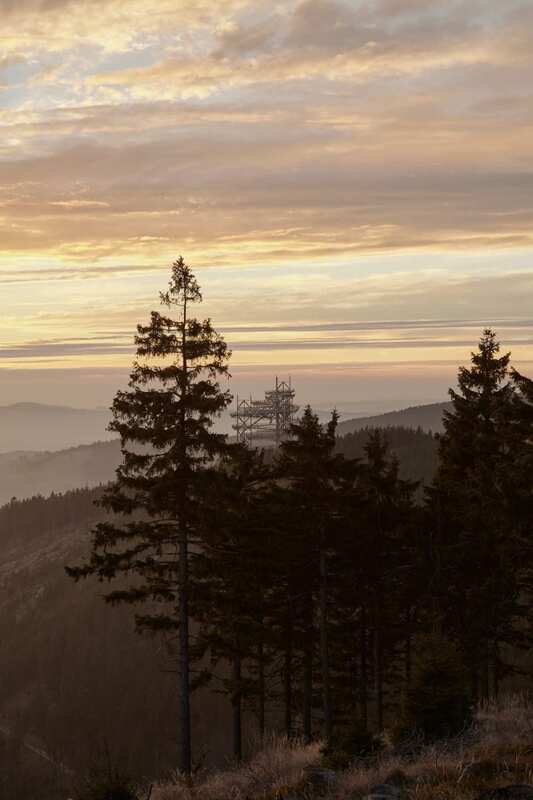 From the incredible views of the surrounding mountains, the tree filled landscape and the River Morava to the experience of making the journey up – there is no doubt that it needed much imagination (and planning) to create. 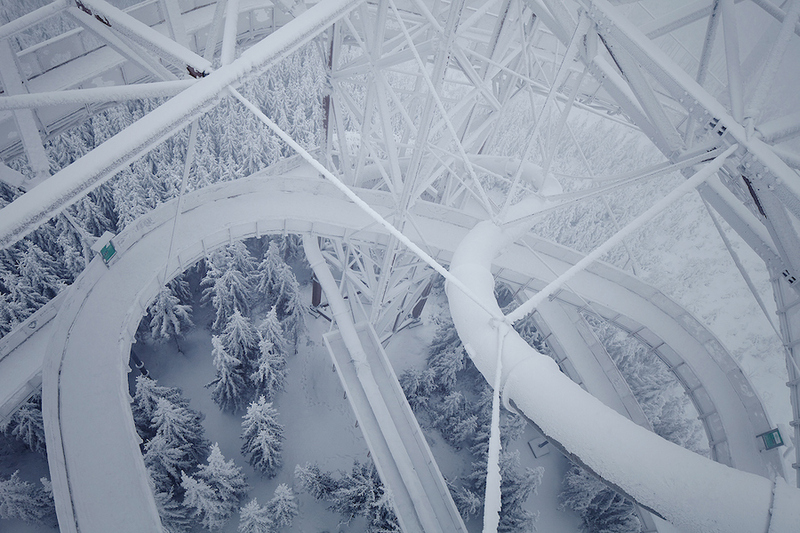 For real thrill seekers and the brave, a net at the top of the path is suspended between a loop in the structure where you can lay looking down the many stories you have just climbed and see the forest below. Also at the top is a spiral lookout point for even more panoramic views. 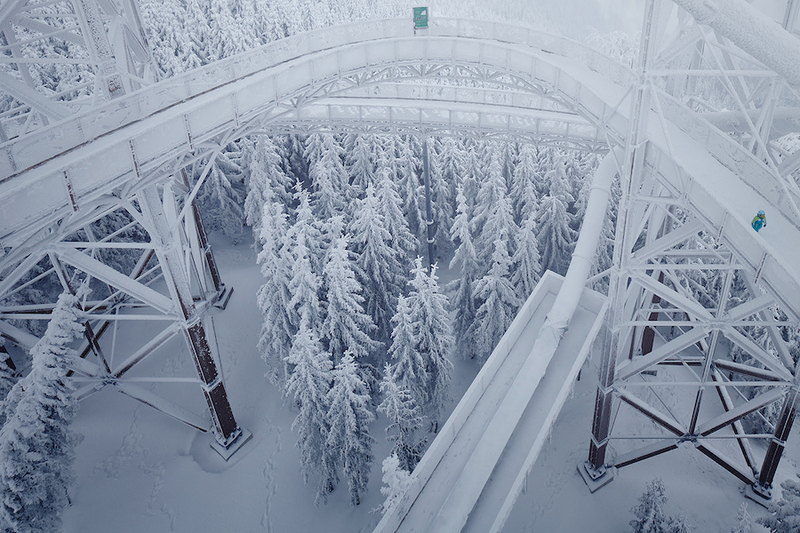 On the way down, you can either choose to walk the way you came or you can take a 101 meter rollercoaster style slide to get to the bottom in a fast, fun and easy way. 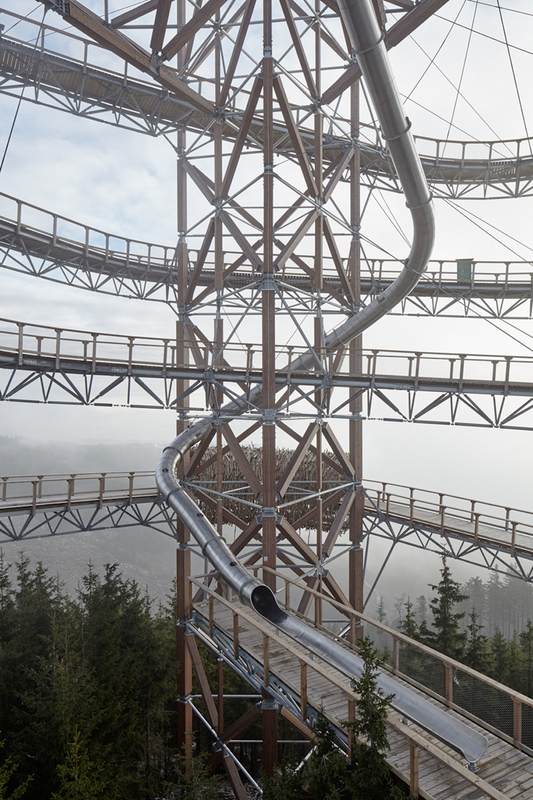 The enclosed slide has many windows along its length, and though you are going to fast to enjoy the view, it surely makes it a little less claustrophobic. 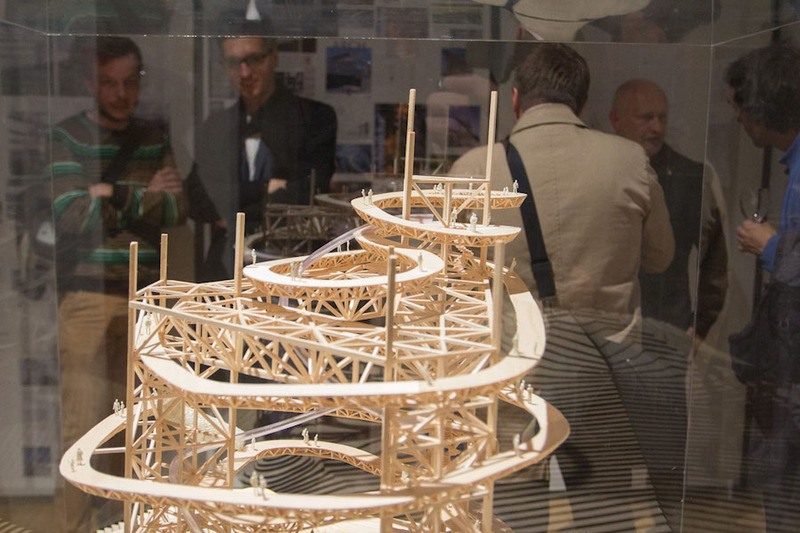 An exhibition at Prague’s Jaroslav Fragner Gallery shows a mini replica of the construction along with more of the history behind it. 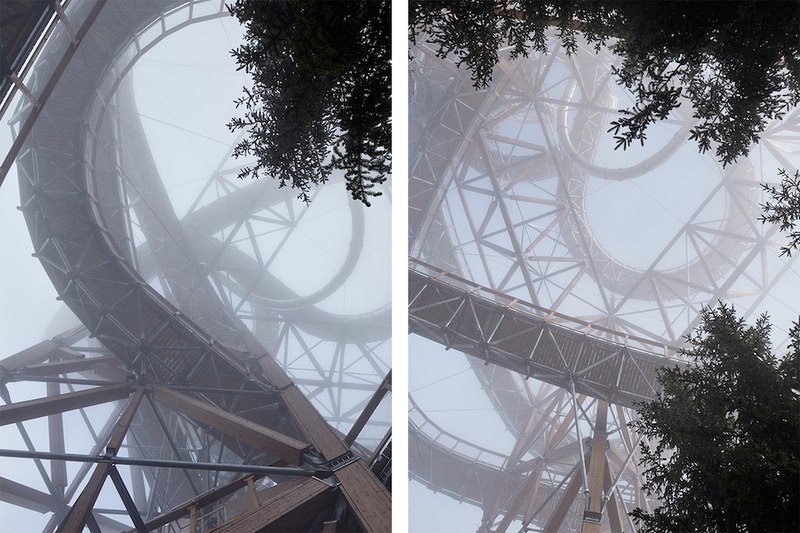 “The Skywalk is a conceptual building, and it offers visitors an intense sensation of walking in the clouds and an experience of a space above the landscape.” says Fránek of his incredible masterpiece. The Trail Among The Clouds as it is also called, offers visitors an intense sensation of walking in the clouds and experiencing the space above the natural landscape. 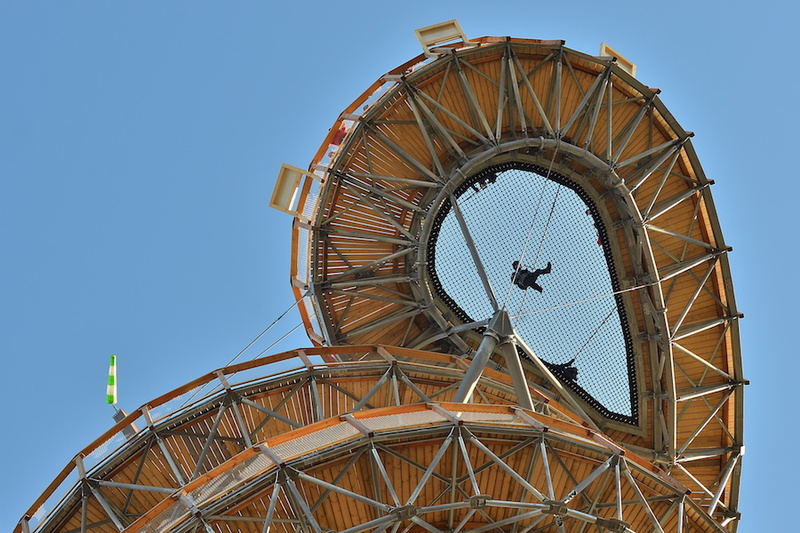 Perfect for those who seek adventure or entertainment or who wish to play with their fear of heights! 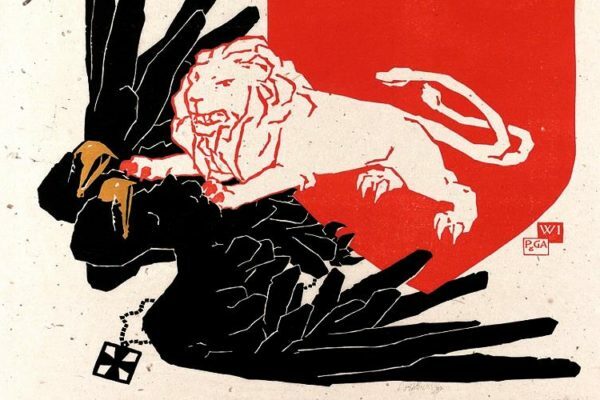 Make sure to visit when in the Czech Republic. 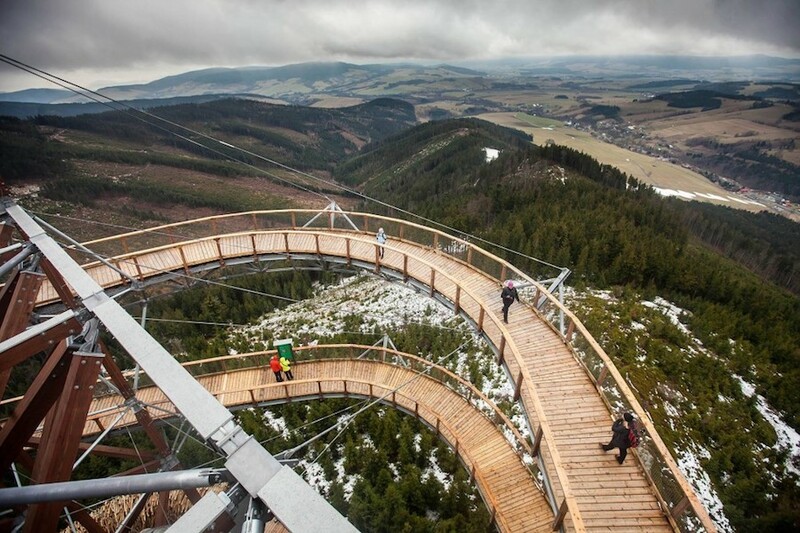 It is located at Velka Morava 60, close to chata Slamenka, Dolni Morava 561 69, Czech Republic.